This week, the blog post is provided by Aaditya Sathish, an undergraduate student from the College of the Atlantic, Maine, USA, who has just completed an internship with the Society. During his time we us, he has been working with the Papers of Edward William West, beginning to get them ready to go on our online catalogue, as well as undertaking independent study on West, his life, and his interest in Pahlavi texts. We are very grateful to Aaditya for the work he has done – the West Papers are an interesting and research-worthy collection, which have had infrequent attention in recent times, perhaps due to the lack of a modern list and catalogue for them. 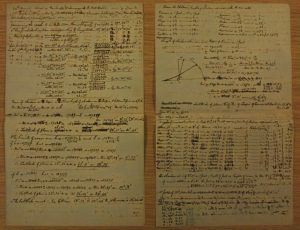 Aaditya’s work has enabled the possibility of a comprehensive catalogue of the material to make considerable progress, and we hope, in the coming months, that the catalogue of the Papers of Edward William West will be added to our growing resource on Archives Hub. I was looking for an internship a few months ago. Every organisation that I glanced at intrigued me, but did not excite me—except the Royal Asiatic Society. As a student interested in postcolonial studies, I have only read literary and historical accounts of colonialism. The internship at the RAS offered me a chance to work with documents from that period whilst giving me a taste of what archival work entails, a path I have considered pursuing upon the completion of my undergraduate degree. Nancy Charley and Edward Weech gave me the opportunity to work with the Personal Papers of Edward William West, an orientalist scholar and engineer who translated Zoroastrian texts into English. Although, I was not familiar with Zoroastrian Studies nor with West’s work, I wanted to learn more about this man who started off as an engineer only to end up as a revered translator of Pahlavi literature. In cataloguing his papers, I wanted to understand how I will make my work accessible to the audience that will be interested in West’s work. This was made possible under Nancy’s and Ed’s guidance, for which I am extremely grateful to them. I started by reading “A Provisional Handlist of the Late E. W. West’s Papers Preserved in the Library of the Royal Asiatic Society” written by P.J. De Menasce in The Journal of the Royal Asiatic Society of Great Britain and Ireland. This was the “original order” that I had to retain; it helped me understand what it is that de Menasce has missed out and what it is that is currently available. After going through the 5 boxes that contained his papers, I realised that there could be many more scholars that might be interested in his work than those for which P.J. de Menasce aimed. I was told by a Professor at my University, College of the Atlantic, that the role of the archivist is to structure knowledge—to identify their genealogies, make connections. That responsibility came to the forefront of my thoughts as I made my own handlist. De Menasce’s handlist worked on the assumption that scholars consulting the West papers will only be those interested in the translation of Pahlavi texts. This was made clear, as anything that seemed to be wavering on the border or the outside of this criteria was not accounted for or given a really shallow description. I found at least 15 more handwritten manuscripts than de Menasce had listed; West 56 was similarly inadequately described in less than 4 lines when in reality its description and dissemination ought to be more detailed as it included a considerable number of items. Of course, de Menasce was a researcher interested in the Pahlavi texts; he was not an archivist. I was struggling to understand how I would represent the Personal Papers of West considering that I had to remain as true as possible to de Menasce’s handlist, as it still is a very useful resource. I started focusing on the inserts that I found in the text, they were fascinating insights into West’s life and research methods that made reference to manuscripts that may now be either hard to access or lost. One of the most fascinating things that I found were his calculations in which he was determining the latitude of where some observations were made in about 1300 A.D. using trigonometry. West calculates the latitude of the observation of an eclipse as it was described in 1300CE. Many of the inserts made reference to another text or were intertextual to his Personal Papers. I often saw these inserts as parergonal openings – footnotes that were and were not part of the book, an object that breaks the contingency. I saw them as indexical moments that pointed elsewhere — opening the binding that the text is kept within and unravelling it to unexpected territories. Even in paying attention to these inserts and to other material ignored by de Menasce, it is obvious that I am still structuring knowledge, and hence, privileging some term over the other. There may be another archivist in the next 50 years that will tell me that I did it wrong. What is, then, the right way to do it? The privileging of some way of knowing is necessitated and impossible to do without. I come out of these two months wondering what an ethical archive would look like? Could it be devoid of the imposed (violating) structures? Would it be wary of the necessity of structuring (the erasure of some information) in one way and not another? Are there other possibilities? 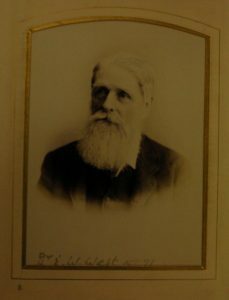 Edward William West, the oldest of 12 children, was born in Pentonville, London, on 2 May 1824. He was the son of William West, the owner of many cotton presses in India, and Margaret Anderson. His ancestors were “builders and mechanics.” He was often ill as a child and was home-schooled. He entered a school at Pentonville from the age of 11 to 15. He then started studying engineering at King’s College, London, where he won High Honours in 1842. His parents had lived in India for some years before their marriage. His father lived in Bombay, and his mother in Calcutta. In 1844, West went east to superintend the large establishment of family owned-cotton presses in Bombay. He worked there until 1850. During this time, he had a close relationship with his Parsi butler, testament to which is in the unpublished memoir of his brother, Arthur William West, and a box of Edward West’s papers, both items held at the British Library. In 1852, he became the Chief Engineer on the Great Indian Peninsula Railway Project. More on this can be found in the British Library. From as early as 1850, he studied the Kanheri caves in Mumbai where he discovered the remains of four tapes. Guide to Kanheri Caves suggests that his most important contribution to academia before he moved to translating the “Pahlavi Texts” was of one of the sealings that “depicted a seated Buddha in Bhumisparsha Mudhra with ornaments around the figure and an inscription underneath” (Wani 6). He presented his findings to the Bombay Asiatic Society on the 12 April 1860 which were then subsequently published in the January edition of the Journal of the BRAS under the title “Copies of Inscriptions from the Buddhist Cave-Temples of Kánheri, &c. in the Island of Sulsette, with a plan of the Kanheri caves” (West 1861). West’s legacy, to this day, remains in his brilliant translation of Zoroastrian texts from Pahlavi to English. He was in close contact with the Parsi community in Bombay. A glance at Arthur West’s autobiography and narration of Edward West’s stories shows the presence of Parsi butlers in his house and managers in the cotton press. A commonly accepted speculation regarding West’s inspiration to translate the Pahlavi texts was Martin Haug’s publication, “Essays on the Sacred Language, Writings, and Religion of the Parsis” (Bombay 1862). An edition of the same text, “edited and enlarged” by West, was published in 1907. West began his work on a copy of the Avesta, or the scriptures of Zoroaster accompanied by a Gujurati translation of the Avesta and Dhanjibhai Framji’s ‘Pahlavi Grammar’ (1855). He would then continue his study of Pahlavi with Haug. Haug and West returned to Europe in 1866, where Haug was appointed to the position of Professor of Sanskrit and comparative philology at the University of Munich. West went to Munich for six years (1867 – 73) where he spent his time translating the Pahlavi texts of Zoroastrianism. On 17 June 1871, the University of Munich bestowed upon him an honorary degree of the Doctor of Philosophy. After a year in England (1873–4) West revisited India (1874–6) in order to procure manuscripts of the important Pahlavi books, ‘Dēnkart’ and ‘Dātistan-i Dēnīk’; he paid a last visit to the Kanheri caves on 6 Feb. 1875. He meticulously drawn plans of the cotton presses and new developments can be seen in the British Library. The traces of this meticulousness can be observed in his Personal Papers that are held in the archives of the Royal Asiatic Society and in some further plans and notes that he co-collated with his brothers, also available in the RAS Collections. From 1876 to 1897, West worked on translating the Pahlavi Texts Vol. 1 – 5 for Prof. Max Müller’s Sacred Books of the East Series. His work was widely recognised by Zoroastrian and Orientalist scholars from the West and the East. His meticulous footnotes in the personal papers at the RAS show his commitment to the collation of several manuscripts, many of them kept in poor condition by the archives and libraries; through his footnotes, he marked the differences and similarities he found in the manuscripts while paying attention to the interweaving of different languages in a single manuscript (i.e. presence of Sanskrit, Persian, and Guajarati). His service to the profession was widely recognised: The Bavarian Academy of Sciences in 1887 made him a corresponding member; he was a member of the Royal Asiatic Society of Great Britain and Ireland and on 6 July 1901 he was presented with the Society’s Triennial Gold Medal, personally handed to him, with an address, by the Prince of Wales (afterwards King Edward VII); The American Oriental Society awarded him an honorary membership. West was also in correspondence with the scholars of that time such as Peshotan Bharamji Sanjana who was interested in the inconsistencies that West found between his father’s manuscript and other copies of the same manuscript. He died in his eighty-first year at Watford, on 4 Feb. 1905. He was survived by his wife Sarah Margaret Barclay, and by an only son, Max, an artist. As part of his internship, Aaditya also curated a display of West’s Papers in our Reading Room. We hope that visitors to the Society will, through this, be able to enjoy and understand more of West’s work. We would thank him and all our interns, placement students and volunteers who give of their time to help us make our Collections more accessible to researchers and the wider interested public.